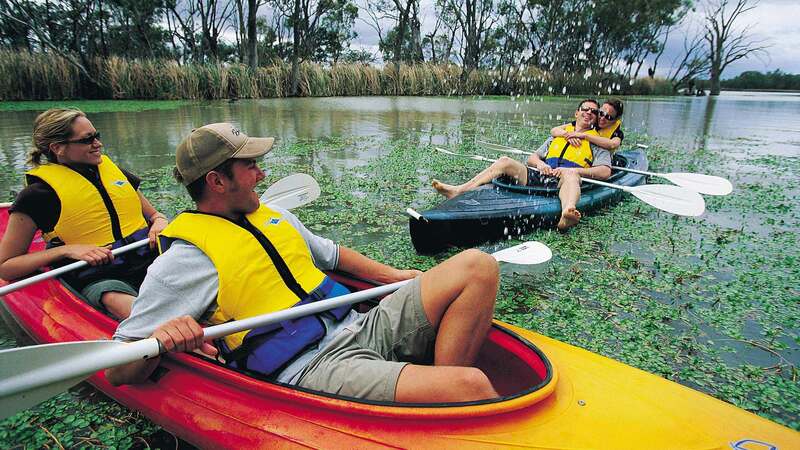 The Riverland is a popular backpacking destination - a must-do experience for backpackers. Offering endless sunshine, an affordable lifestyle, the biggest river in Australia - the Murray River, a laidback lifestyle, great water sports and attractions. A vibrant fruit industry creates employment options and several unique accommodation options, which are a drawcard for those looking for seasonal work or just travelling for fun. Check out our accommodation and spend some Rivetime in the company of our unique Australian wildlife that includes kangaroos, emus, kookaburras and cute koalas. Working hostels are fantastic for travellers. Unlike hostels in tourist parts of Australia, working hostels provide accommodation and fruit picking jobs. The Riverland is South Australia’s largest fruit producing region, which offers work all year-round, with the busiest months being May to October. Tell the friends you’ve made in Australia to meet you on the river for some “river time”. Spend days canoeing, fishing, water skiing, swimming and cruising.